For this project, I made faces. I was really intrigued by the Chernoff faces, not necessarily as a method of visualizing data, but just as a way to, for lack of a better term, express expression. They’re also really cute and fun to look at. 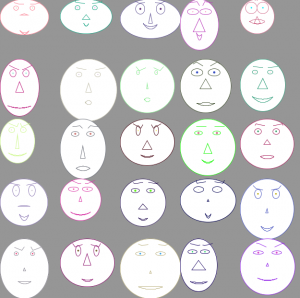 I created faces by randomly adjusting 20 different values associated with the head size and shape, the eyebrow size and shape, the eye size and shape, the pupil size and color, the nose size and shape, and the mouth size and shape. I spent a lot of time tweaking how the different facial features interacted with each other to find positions and sizes that fit and made sense. And as you can see from the next photo, I also spent some time creating (and debugging with squares) more natural looking heads and smiles. Alright, now I’ve got a bunch of faces…What next? 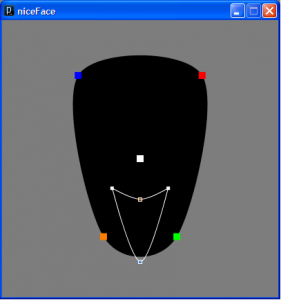 At first, I thought about breeding faces based on user input. But I think the world already has a notion of what an “ideal face” looks like. So instead, I decided to reveal some identity behind this cartoony face. To do this, I hired people on Mechanical Turk to “name a face.” And name a face they did. In five hours, there were already over 400 names accumulated for my faces. The video below showcases some random faces and their names. Project 2: Making Faces from Jordan Sinclair on Vimeo. There are two directions I would love to pursue. 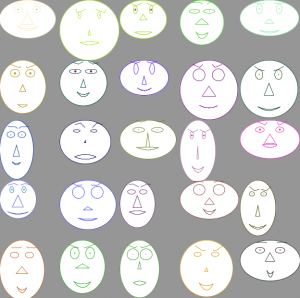 The first would involve creating life-like chernoff faces to visualize data, though, I could certainly see social issues arising. The second direction would be to visualize these names and their faces. What does “John” look like? How about Bertrand? Or Francois? Perhaps I could create a limited set of faces and names, and visualize the connection between faces and names.